Lately I have been thinking about the concept of public service and how being a public servant can guide us as fire fighters. As with most things in life it is easy to take for granted the culture that we inherit when we enter the fire service. For the most part the public that we serve generally considers fire fighting to be a worthwhile and noble profession and believe that those who wear the uniform of a fire fighter embody these characteristics. Surely every ounce of public trust has been earned with the sacrifice of those who have come before us and our brothers and sisters, some who have given so much in the pursuit of this calling. 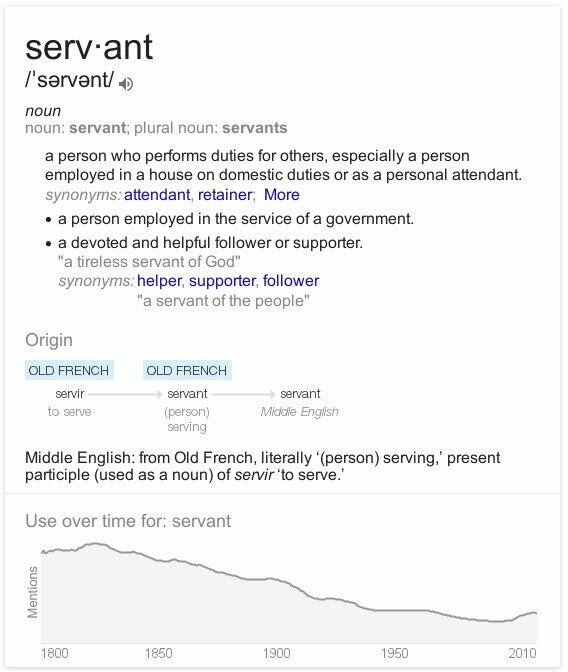 While planning to write this article I looked up the definition of “servant.” Not surprisingly the first definition that comes up is “a person who performs duties for others.” Google also provided a graph of mentions of the word “servant” over time. Use of the word “servant” has been generally trending downwards since the 1820’s. It may be coincidental but this will probably come as no surprise to volunteer fire departments who have been struggling to retain members and increasingly so in the past two decades. My interactions and experience would lead me to believe that those within the fire service the trend to abandon the idea of the public servant but I am sure that every one of us can think of someone we know that puts themselves before the public. CITIZENS or CUSTOMERS? A recent trend has taken over our municipal fire services where the public and citizens are referred to as 'customers.' Is this really the term that we wish to use to describe the people that we serve? The people in our communities are not simply buying goods and services from The Fire Store and they have none of the usual recourses associated with customers or clients who find that the service is lacking. We did away with the commercialization of the fire service years ago so it seems misguided to try to label the public as mere consumers. The idea of seeing ourselves as public servants is a powerful guide for everything that we do in the fire service and how we conduct ourselves both in and out of the all-seeing public eye. Applied to station routine it is clear to see that we need to take care of our fire halls. We are caretakers of a tangible public investment and our pride in our stations and equipment is a reflection of the worth that the public has seen fit to invest for our sake and theirs. Apply the same concept to training and we can see that it is essential not only for our own safety but as a means to ensure that we are always prepared to serve in whatever capacity we are called upon for. A person who dials 911 isn’t asking for a bunch of people to TRY and solve their problem, they are expecting a team of well-trained fire fighters who WILL solve their problem. It therefore follows that we should be as well-trained and well-prepared as possible or we risk not being able to serve let alone do our jobs. It is also important to remember that putting the public first has real benefits for our families, friends and even ourselves. During his talk at FDIC 2014 Aaron Fields had this to say about protecting survivable space: “If I make it good for them, it is by definition good for me. I am protected, they are not, and they are why I am here.” This attitude is essential and it is nothing less than what the public expects. How else are we to keep their trust and faith than by continuing to meet their needs and provide what they have expected since the dawn of the fire service? Lt. Ray McCormack has argued and Dave LeBlanc later echoed McCormack's thoughts that “placing ourselves above those we serve does not make us safer. Instead it makes us poor firefighters and confuses our sense of purpose by breaking the number one commitment we made when we signed up for this job.” I would add that “the job” is public servant, we are firefighters by trade and that we can’t truly fulfill our roles unless we seek to serve the public.